There are two indisputable truths in life: death and taxes. Most of us plan for end of life by making out a will to dispose of assets, creating trust funds to take care of minor children, preparing funeral arrangements. But how many people consider their digital assets, which include photos, files, and social media accounts? 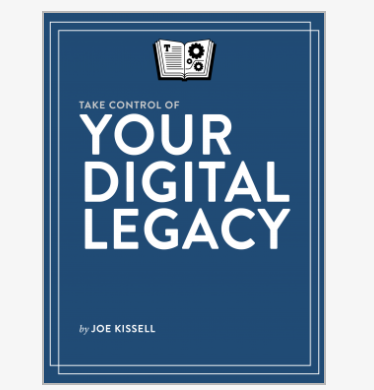 Joe Kissell has, and he discusses it at length in his new book, Take Control of Your Digital Legacy. Kissell states in the introduction, “In short, this book is about digital estate planning.” This is a topic many of us have either never thought about, or had no idea where to begin to preserve or delete data after we’re gone. Take Control of Your Digital Legacy begins with the basics: what types of data or files do you want to leave to future generations? Do you pay bills online? Do you have external hard drives with important data that you would like your family to keep or would you prefer the data be destroyed? Do you own domains that need to be renewed? Should your Facebook account be converted to a legacy account or completely closed? Physical media, such as books, CDs, DVDs, and albums: donated, passed down to a family member, or tossed out? Are there subscription services to be cancelled? These are just a few of the questions Kissell addresses in the book, questions that never occurred to me, yet are incredibly important. To help create your Digital Will, Take Control of Your Digital Legacy contains a link to a downloadable Digital Will Template in RTF format. This will includes areas for readers to fill in their own information, or delete/add details as needed. Once you’ve taken inventory of your digital footprint, the next step is deciding what to keep, how to store it, and who will be your Digital Executor. There’s more to it than just backing up to an external hard drive and calling it a day. Kissell explains what factors should go into your choices, why some options are better than others, and the importance of prioritizing . If you’re active in social media, Take Control of Your Digital Legacy has links to articles for deleting or preserving accounts for Facebook, Google, Instagram, LinkedIn, Pinterest, Tumblr, Twitter, and Yahoo/Flickr. Planning for your digital legacy isn’t just important for your loved ones after you pass on: it could be quite helpful if you go away on vacation, or have an extended illness. Kissell talks about How to Be Me, adding a section to your Digital Will which will assist family or coworkers to fulfill obligations only you know how to do. Take Control of Your Digital Legacy has an incredible amount of information; just looking over the Digital Will made me realize how much of a digital footprint I have. This is a book to read slowly, to think about, to make life easier for those we leave behind. Kissell takes readers step by step on the journey of controlling our digital legacy, or those of our older loved ones. Take Control of Your Digital Legacy might be one of the most important books you’ll ever read.